Genesis panels install quickly and easily fit into almost any ceiling grid system. For use with most 15/16-inch T-bar grid systems. Genesis tiles are not intended for use with 9/16-inch narrow line grid systems. Our lay-in ceiling panels are available in the same sizes as fiber-based ceiling tiles, 2′ x 2′ and 2′ x 4′. If you are using the standard grid size for 2’ x 2’ or 2’ x 4’ tiles, Genesis will easily install into the existing system. There are some grids that use a “stab and connect” system that may cause the corners of the tile to sit higher than the rest of the tile. To cut Genesis panels, mark and score the face of the tile with utility knife and snap tile at cut. A circular saw or table saw can also be used in cutting multiple tiles at once and a RotoZip or hole saw for odd sizes shapes and circular holes – like sprinkler heads or can lights. You may also use a metal angle ruler to score and then snap the tile. To clean Genesis panels, a mild soap and water solution works well, as do most household cleaners. Just spray the cleaner onto a clean rag and wipe. Power washing Genesis panels is also an option, but avoid placing the spray nozzle tip too close to panel in order to prevent damage to tile face. The tiles are unaffected by most corrosive chemicals, but you should avoid using acidic cleaners. Do not use abrasive cleansers to scrub. To prevent the tiles from moving due to significant updrafts, we offer optional hold-down clips that may be used for drafty areas or uneven grid systems. Please contact us for additional information or for answers to any questions that you may have. Install tiles into the ceiling grid with the pre-stressed arch facing upward. Tiles will relax into a flat position. Genesis Recycled Tiles can be installed in front of an existing tile to reduce installation time. Use a table saw or circular saw with a fine-tooth, paneling or finish blade to achieve the cleanest cut. When cutting the tile, place the back of the tile toward the saw to prevent scratching to the room-facing side of the tile, as shown below. Press the tile flat while cutting to prevent chipping. If your ceiling layout requires that you use border tiles to achieve a balanced look to the room, you will need to cut the tiles around the room’s perimeter. Our Genesis Revealed Edge ceiling tiles requires a trim piece be glued onto the cut edge to hold the tile properly in the grid system. Instructions are below. Cut border panels to size. any dirt, oil or dust on the cut panel’s edge. the trim will be attached. Apply revealed edge trim to cut edge of the border panel as shown. Be sure to align properly with panel’s edge. Trim edge piece at an angle if desired. 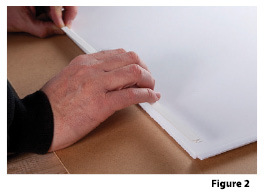 Apply pressure along the entire trim and panel joint to assure proper adhesive bond. Place border tile into grid and repeat until all border tiles are in place. 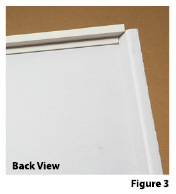 Note: Revealed Edge Trim piece is not intended to support weight other than the tile itself. 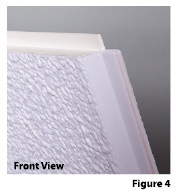 Insulation, for example, can cause trim piece to become unattached. The time to make straight cuts and circular cuts is the same, but the contractor needs to use a utility knife for the straight cuts on our product to score and snap. No electric saw is needed for straight cuts. For your circular cuts they need to use a hole saw – very quick and easy. Less tile damage during installation. With Genesis they should have zero product damage. With mineral fiber tiles they generally experience 10% tile damage due to dropping tile, just handling the tile, or from trying to bow a tile to get in place. Our tiles can be bowed to get into tight and smaller places and to accommodate HVAC equipment above the grid without breakage. Results in a much faster install than any of the other products. You cannot bow the mineral fiber tiles without some breakage and the vinyl clad tiles have very little give. Another positive of Genesis tiles is fewer razor blades need to be replaced. 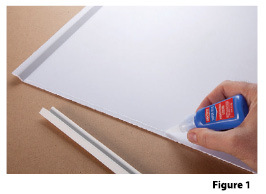 Our PVC does not dull the blade as quickly as the other ceiling tiles. One of the most significant positives of Genesis is that it will take half the time to clean up after the tiles are installed – dust from gypsum tiles or mineral fiber dust makes a mess and takes considerable time to clean all of the equipment, counters and floors. Contractors should be collecting the PVC scrap pieces and taking to a local recycler rather than throwing scrap away. The recycler will pay for this material and saves it from going into the landfill.